A gunfight in a sleazy bar. A heart-pounding chase through a subway station. A tense standoff on the top floor of a corporate high-rise. Wherever an adventure takes you, this book has the maps you need. 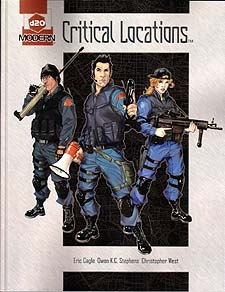 d20 Critical Loactions features 4D amazing, full-colour maps around which Gamemasters can build encounters. The book also includes special rules, game statistics, and adventure seeds designed to save Gamemasters precious time. To use this product, you also need the d20 Modern Roleplaying Game. This product is compatible with other d20 System roleplaying games.